No Short Corners: Klinsi, it is. I think this is probably a good move. 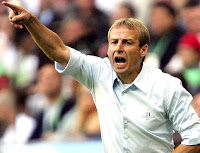 After all, Jürgen Klinsmann was able to coax a new style out of Germany on the way to a bronze finish at World Cup 2006, when they were originally not considered among the very top favorites despite being at home. I will merely assume that Claudio Reyna's new USMNT system curriculum has been taken into account during this process, which means we may see some real 4-3-3 to go along with that 4-2-3-1. The sets are "first cousins" and I don't expect so much trouble installing one (should Klinsi choose) as many out there seem to do. It just takes a little time and the right tactical "can do" attitude. And kinda lost in this shuffle is another guy who will greatly benefit from the coaching change. It may sound funny or even perhaps insensitive at first in saying it, but I am going to say it anyway because it's hella-true. Finally... Michael Bradley does not need to wear that "coach's kid" albatross around his neck at all times. It may not seem like a great silver lining right now, but I believe in no time he'll find it rather liberating in an important way. What about Bob? Well... everybody and their mother seems to expect he'll look for a job overseas. The problem in that is timing: his rep has taken a small hit and obviously jobs are already filled for this season. I guess that means we all go on English manager sack watch. I've been a sometimes harsh critic of certain Bradley ways and means, but the firing did surprise. From what I've heard in the back corridor, it seems like a good decision and this was the time to do it if at all. I do appreciate the effort Bradley brought to the job and he has much to be proud of, as well as a few lessons to learn. He's a smart and determined guy, so he'll probably grow from it. As for all of us, it's now Klinsi time, which I'd imagine involves drinking beer somehow. Let's hope it's for a "Fest" and not in fan frustration. Welcome to the job, Jürgen. I hope your deodorant's good. This is not your mutter's USMNT bubble. Now, it's always hot in herrre. UPDATE: Will and I overlapped there, so I just moved his 2010 rewind clip presentation over here. First touch. So is Klinsi gonna teach 25 million Americans how to handle the ball? Basically what he's saying is: too many players in the 2010 squad lacked the skill of good ball handling. Yes, he can ramp up technical work some, but the reality is that having "handle" isn't all about skill. Part of it is mental and the USMNT needs to adopt the attitude of being a team that feels comfortable having the ball. Reyna addressed this at length in the new curriculum for the youth set-up along with an overall new "essence" of play for the senior side. It's not quite so simple as... well, who's going to teach everyone first touch? Any insight on how much overhaul will come to the rest of the USMNT staff under Klinsi? Is he bringing in his own assistants, etc? Any idea on some candidates to be his #2? No clue. Wish I knew. As far as I know, the assistants still have their jobs at this time. Well, I for one find that the continued silence on who is replacing Thomas Rongen to be... interesting. This may sound crazy.... but I have a theory on that. I suspect they have someone who is still finishing his coaching license that they want to take over there. Also, there seem to be some rumors about Martin Vasquez being brought in. Not sure that'd be an inspiring hire, though. When does he have to name his squad for the Mexico match by? In today's presser he said he'll announce the roster by Wednesday. At least that's what I thought I heard him say. Greg -- in my crazy crazy head, I want that person to be Frankie Hejduk. No, it doesn't make any sense.